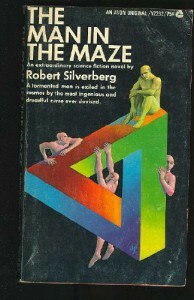 Aside from the blatant sexism infused throughout this novel, I really really enjoyed the main plot of the story and the three men both in the literal physical maze, as well as their own internal "mazes" of both emotional, psychological and moral design. In the newer edition that I read, Neil Gaiman has written an introduction which does allude to the sexism/objectification of women though not with as much of a warning as I would have liked. There simply is no excuse for this theme both to the extent that it is used within the book and that women exist within the book as nothing more than playtoys and sexual fantasies/reminiscings - if there had been a counterbalance, perhaps I would feel somewhat differently. Gaiman also mentions that the maze and its construction is very much like the puzzles that are now so common in the gaming world and hence may be very familiar to the modern-day reader. Indeed, the maze did have that familiar feel to it, in that sense, but that didn't detract from the story because at heart the story isn't about the physical maze... not really. It's about the three men and their interactions with each other and within themselves. And that's the part that I enjoyed the most.The end of the book... I won't spoil it - but I didn't like that as much. It was too much of a deus ex, if you ask me. And a bit too hokey. Ok a lot too hokey. And I'd rather give this book a 3.5 but because I cannot and because of the sexism and the hokeyness, I am going to have to settle for a 3 out of 5. But, in truth, this story is truly worth the read, as long as you aren't easily offended and enjoy a bit of solid psychological science fiction.